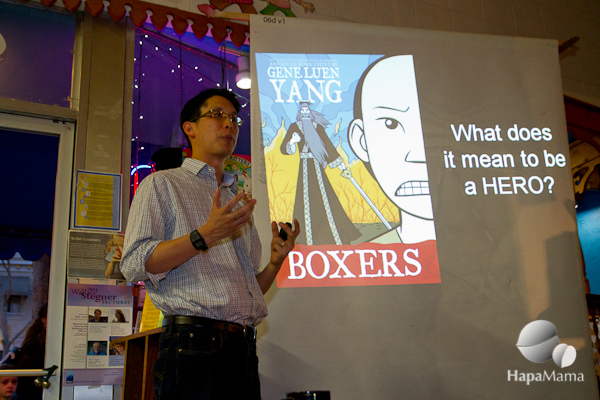 I finally got around to reading Gene Luen Yang’s Boxers & Saints , the two-volume graphic novel set during the Boxer Rebellion in China. Or rather, I just finished the Saints portion, the shorter book about a Chinese girl who converts to Christianity. 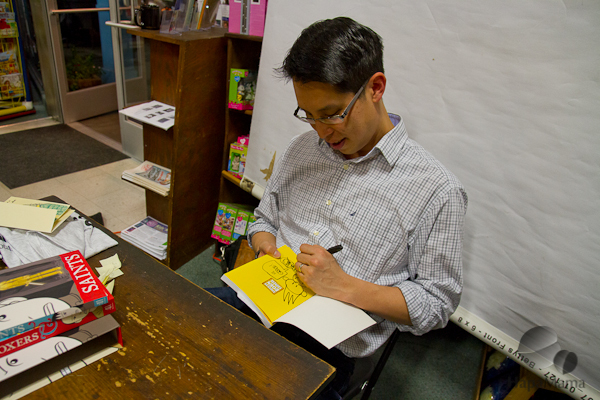 A few weeks ago, I caught up with Yang during a book signing at Hicklebee’s Books in San Jose. 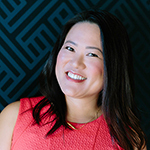 Book signing is an inadequate term for Yang’s presentation, as it felt more like a university-level lecture in Chinese history, religious symbolism, and rhetoric. The interesting kind of college lecture, that is, as a room packed with teenagers listened intently as Yang scrolled through a slideshow explaining his detailed research into this uprising of Chinese peasants against European Catholic missionaries. 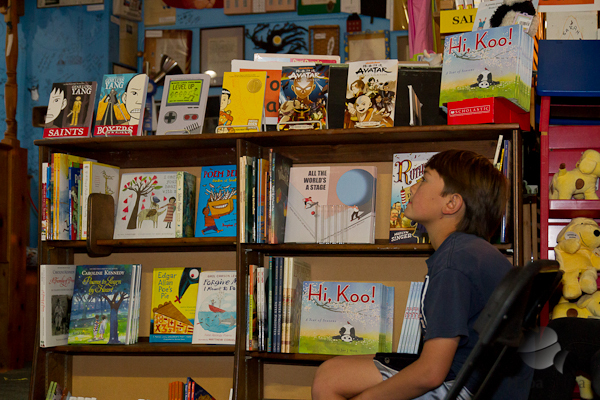 I brought nine-year-old Little Brother with me, and even he was fascinated by the talk. Nothing in Boxers & Saints was left chance, as everything from the choice of characters, the length of the volumes, even the colors used in the illustrations were intentionally chosen to reinforce the idea that stories — even history — is deeply influenced by our culture and worldview. I was drawn to reading Saints first, with its female protagonist, a character inspired by one of Yang’s aunts, who was shunned for being born on an “unlucky” day and later found solace in Catholicism. Four Girl (who is so inconsequential in her family that she isn’t even given a proper name) runs away and joins a community of Catholics, the “Saints”. Four Girl, or Vibiana as she is later known, is scrappy and headstrong, with no one to rely on but the periodic visions of Joan of Arc. Little Brother commented that the story reminded him of Mulan, because she was a daughter who left her family to fight. But I’m glad I didn’t read the book with my younger son. After all, Yang cautioned during his presentation that Boxers & Saints is not for little kids. There are some violent scenes and the ending is not happy. Historically accurate and symbolic, but probably something which requires a little more maturity to understand. Want another chance to meet Gene and get your book signed? Check out his calendar of events, and if you’re in the Bay Area, visit Hijinx Comics on Free Comic Book Day.